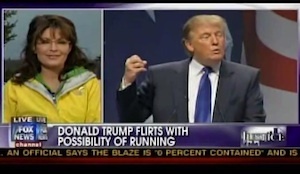 Sarah Palin was interviewed live today on Fox News’ Justice with Judge Jeanine, and was asked to weigh in on the rather sudden addition of Donald Trump‘s voice to the “Birther movement“, as well as the money “The Donald” is devoting to researching the existence of the president’s birth certificate. Palin’s answer? She noted it wasn’t that unthinkable for Trump to be curious about Obama’s birth certificate, as it was an issue that has transfixed a sizable segment of the body politic. She expressed hope that perhaps Trump’s piles of money would be the key ingredient missing from prior investigations of the President’s birthplace; Orly Taitz, despite having about 10 jobs, doesn’t have a hotel in New York City —know what I mean? Palin also expressed hope that Trump’s money and resources could counter the $2 million she claims Obama has spent to keep the certificate hidden from the public. Her attitude suggested a quiet, but not overt, encouragement of Trump’s investigation.